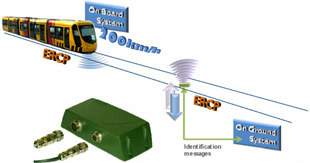 RFID (contact-less transfer of information by radio frequency) allows transfer of information from onboard to ground, from trackside to on board, or biodirectional dialogue. 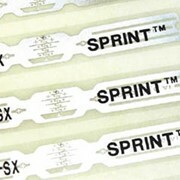 Balogh has been designing and manufacturing contactless identification systems for all environments since 1958. Baloghs palette of solutions covers a wide range of RFID tags, readers and interfaces, targeting the following applications: Industrial Automation & Asset Tracking, Security, Transportation, Railway, Industrial Logistics and The Supply Chain. Industrial Automation: Identification and tracking of industrial processes. Logistics: Industrial logistics and tracking through supply chains. Transportation: Fleet management, vehicle ID, vehicle access. Railways: ID and management of subways, passenger trains etc. Security: Intelligent access control and asset/theft management. 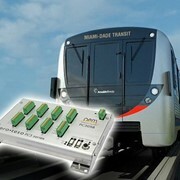 Balogh is an industrial company which designs, manufactures and commercialises a wide range of RFID solutions, including CBTC technologies, covering railway and urban AVI and signalling applications, such as train location, passenger information, cross-road detection and automatic speed control. 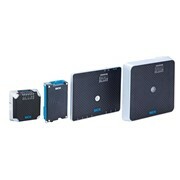 This Balogh RFID product line consists of RFID tags, readers and control interfaces. On board Automatic Sound and Visual Announcements (ASVA). On line train position (ten centimetres precision instead of ten metres with GPS, using both solutions together is an economic solution. Automatic continuous control of train's speed, with automatic urgent braking. Depot or yard management (part of operating system). 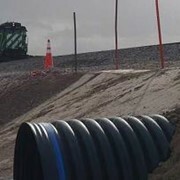 Train configuration: Automatic adjustment of washing facilities according to guage and length of trains, automatic flow adjustment at depot's petrol station. Control of correct vehicle position before being authorised to open the doors (platform screen doors, assistance equipment for disabled access). Adjustments of vehicle's step height according quay's height. Coaches / wagons identification (AVI Automatic Vehicle Identification). On board contactless readable technical history (asset management). Continuous knowledge of wagons position: train composition management. Immediate identification of a coach at hot box detector's passage. Immediate identification of overweight / incorrectly loaded wagons near railway scales. Use the IndustrySearch e-mail feature below and one of the Electro-Com (Australia) Pty Ltd team will respond to your enquiry directly. Electro-Com is a specialist distributor and representative for the leading brands of: - RFID (Radio Frequency Identification) & Access Control (Texas Instruments™ TI-RFid™, Tag-it UHF, Hyper X™, X-Ident™, SALTO Systems, PDC™, WaveZero, Brooks Automation™, AceProx Identifikations GmbH, FEIG Electronic™, SecuraKey™ & AxcessInc™). Electro-Com is Australia's leading and largest supplier of RFID equipment including RFID readers, cards, tags and antennas to various markets including, supply chain logistics management, retail, access control, automotive applications and animal/livestock identification. Electro-Com have every frequency covered. 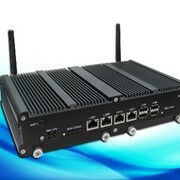 From 132KHz low frequency, 13.56MHz high frequency, 915MHz ultra high frequency UHF to long range 2.45GHz technology. 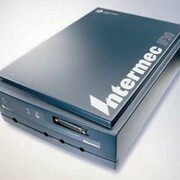 - 19 Data racks and electronic enclosures (SME). From network enclosures through to 19 server enclosure racks and outdoor enclosures to open racks and consoles, Electro-Com can address and provide you with total electronic equipment enclosure solutions matched with superior quality and the right price. - Electro-mechanical components, sensors & control products(Sensata Technologies™, Klixon™). As the officially appointed agent for Sensata Technologies (formally Texas Instruments Sensor and Control products), including the 'KLIXON' product families. Electro-Com stocks a wide range of quality electro-mechanical devices, sensors and controls, in accordance with customer requirements. 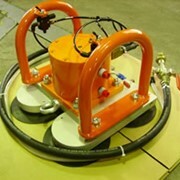 Mention IndustrySearch so Electro-Com (Australia) Pty Ltd can best assist you! Get a callback from an expert at Electro-Com (Australia) Pty Ltd to help answer your questions.